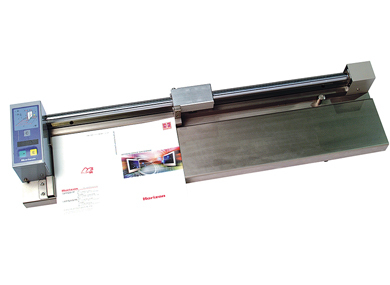 The Standard Horizon SB-09 nine-clamp perfect binder features automated operation, push-button simplicity, and high-quality production perfect binding. Key features: A 10.4″ intelligent color touch-screen control console, automatic air-suction cover feeder that handles a wide range of cover materials without marking, automated in-line cover scoring, and job programming. 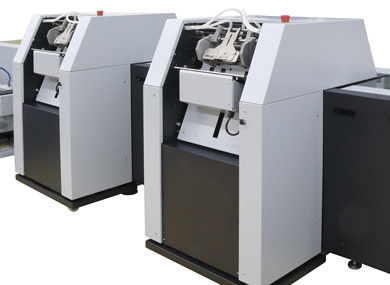 High efficiency: The SB-09 is designed for single-person production of up to 4,000 books per hour. In-line trimmer: The SB-09 can be run as a stand-alone binder or as a binding system with in-line three-knife trimming when connected to the HT-110 Three-knife Trimmer. Measures the dimensions of the actual book block to be bound and sends those values to the binder. The ASF-SB adds a sheet to the front or rear of the book block. It is possible to feed a signature to a section and also to feed an end sheet for case binding.